Android video calling is finally here. If you haven’t downloaded Vonage Mobile® yet, there’s no better time than now with the launch of video calling*. That’s right, if you are an Android user, you can enjoy free two-way in-app video calls over Wi-Fi or 3G/4G with any Vonage Mobile user, anywhere in the world as soon as you download the app. And, if you already have Vonage Mobile, all you need to do is upgrade to the latest version. We know there are other video calling apps out there, but Vonage Mobile lets you switch from video to voice-only (and vice versa) while you’re on a call. Vonage Mobile isn’t about any one feature. It’s about providing you with the most flexibility in mobile communications and letting you easily connect with your friends, family and business contacts in the same network. Current app users already know just how easy it is to search their address book for fellow Vonage Mobile users so they can talk and text with each other for free. But, now there’s an added convenience – the updated version of the app also checks your address book to see who in your network can video chat with you, just as it does for calling, texting and photo sharing. We’re also continuing our Refer-A-Friend program, so you can invite friends via SMS and earn $1 of calling credit for each friend who becomes a Vonage Mobile user (up to $10). 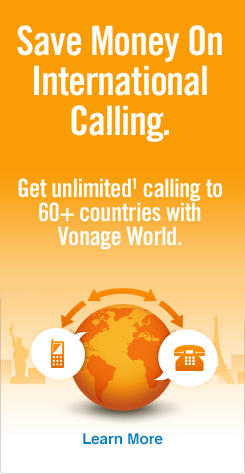 You can use these credits to call non-app users all over the globe at Vonage’s super low international rates. Enhance your next conversation with Vonage Mobile’s video calling, and get closer to those for whom you care most.